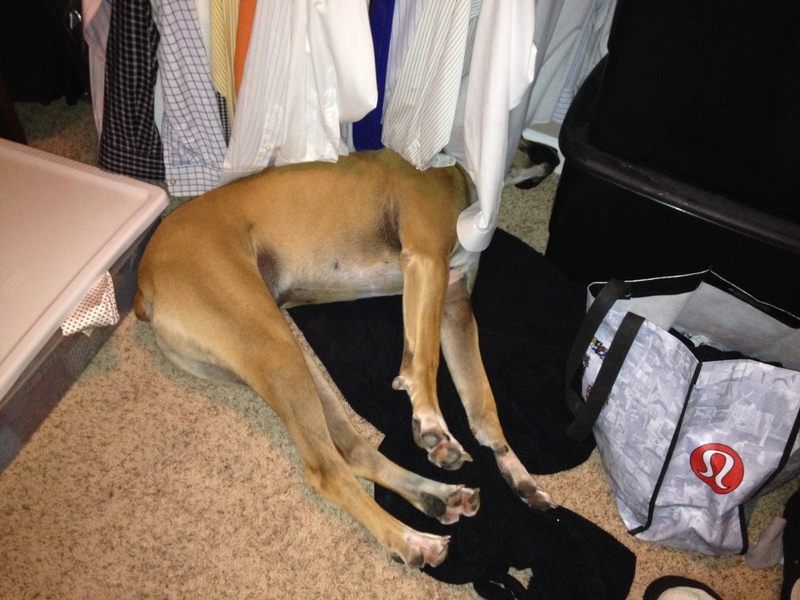 Luke likes to “rest” in the master closet. My friend Jay said it best: Fanny kicked my fanny. I rested Wednesday, and it was good. With my new responsibilities, however, I never fully rest, as I always warm up and cool down with, as well as demonstrate proper form for, CFS athletes. Yesterday I coached the lovely and delightful 6 and 7 am Boot Campers, vacuumed the floor, met my friend Christine in Durham for a cup of coffee, visited my good friend Jason at Bull City Running, returned to the box and mopped most of the floor, taught Foundations for Sam and Melissa, walked Luke, rested momentarily, returned to the box to finish mopping, worked out, and then taught Foundations once again. The electricity went off just as I began to work out. As I knew there was a good chance that it would, I used a handheld timer. Yup, this was tough. I was somewhat self conscious, as there was no music playing. I was tempted to begin singing show tunes, and “The Sound of Music” is always the first song to come to mind. I completed all rounds of hang power cleans and pushups unbroken. I was usually able to string together quite a few unbroken double unders, and even completed the last round with 50 unbroken reps.
My time was 10:30. Yup, I’ll be programming this at CFS. I completed today’s programmed conditioning. I chose Option A. Imagine that. I was somewhat all over the place, as I didn’t want to complete any activity to failure the first or second round. Ring pushups were particularly challenging, you know, because I completed 50 just yesterday evening. My total was 136 — the same as Zoie’s! And it is challenging to work out and to program, as I often like to try a metcon before including in programming. And that’s okay.